As we roll into 2011 we're watching culinary trends evolving into high versus low. On the one hand, renewed populist thrusts towards classic comfort foods like pie hearken back to the traditional values of heartland America and the flavors of Grandma's kitchen. In the other direction, molecular gastronomy hits TV and the home chef's kitchen, while among restaurants, high-end foragers seek the holy grail of exotic, esoteric wild foods. Bartenders follow suit, amping up handcrafted artisan cocktails to the level of potions mixed in a rarefied herbal apothecary. Traveling the road of nostalgic American comfort food in the past decade, we've encountered cupcake madness, mac n' cheese mania and the burger revolution. This year folks are crazy for pie, from old-fashioned apple variations to mini pies, savory pies, deep-fried pies, ice cream pies and even wedding pies. Americans ordered 722 million servings of pie at restaurants last year, according to NPD Group. That number is expected to rise further, as pie shops are popping up all over. At New York's hip, retro fried chicken joint (did we mention fried chicken is also spectacularly on the rise?) Hill Country Chicken patrons flock to a pie happy hour to savor flavors from classic apple to whiskey buttermilk. April Bloomfield's new restaurant The Breslin offers a personal-sized savory pie made with Stilton and stewed beef, nicely washed down with beer and ale. Across the pond, BBC News and the Guardian have reported on Britain's growing grey squirrel pie fad, but we sincerely hope that doesn't catch on stateside. Speaking of wild, exclusive restaurants have begun to spotlight exquisite foraged foods in an attempt to offer the rarest, most expensive and mysterious ingredients of forest and field on their menu. Some chefs relish a trek into the woods to do their own wildcrafting, while others hire professionals. Evan Strusinski, a Maine forager, provides top restaurants including Momofuku Ssäm Bar and Gramercy Tavern with wild ingredients like Russian olive berries, cucumber root, lichen, lily buds and orange jelly fungus. California foragers find bounty in treasures like miner's lettuce, wood sorrel, and wild watercress, while Oregon hunters stalk pricey wild morels and matsutake. If you're mystified by what to do with spruce tips or licorice fern, check out Connie Green's gorgeous new book The Wild Table — she's the one who sells her goods to Thomas Keller, Grant Achatz and Michael Mina. Culinary designer Richard Blais on the set of the Science Channel's "Blais Off"
Since its relatively recent inception by "food scientists" and avant-garde chefs — most notably Ferran Adrià of elBulli — molecular cuisine has been one of the most compelling movements in food of the new century. Chefs from José Andrés (The Bazaar by José Andrés) to Grant Achatz (Alinea) have achieved stunning success with these esoteric techniques using chemicals and liquid nitrogen among others, and the movement has engendered both controversy and mainstream commercialization. Traditionalists in Italy were so appalled by the cooking genre that Italy's Ministry of Health passed a bill last year that bans the use of chemical additives and liquid nitrogen from restaurant kitchens. It cited that it was for the "security of its citizens" after the ban was decreed, but underlying was a national attitude by many famous Italian chefs who accused it of ruining an already perfect cuisine! Good thing Columbus discovered America, because over here TV viewers loved Top Chef's last season with contestant Richard Blais (FLIP burger boutique) whipping up some extremely entertaining molecular magic in the studio kitchen. The Science Channel liked it so much they gave the iconoclast chef his own science-based cooking pilot called "Blais Off" hoping to turn it into a series. Not least, for home chefs the web has exploded this year with sites offering molecular gastronomy supplies, ranging from www.tienda.com with a dazzling line of Adrià's Texturas products, to Amazon.com's WillPowder that has super deals on molecular chemicals — and next day delivery. While last year we celebrated the rise of the food truck, a year later these mobile eateries seem so ubiquitous that we hardly notice them anymore. Except when we're hungry. What's notable is the diversity that has sprung from the first wave of pioneers, offering diners on the go more and more choices that reflect our various lifestyles. 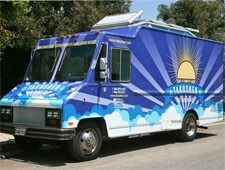 In Charlotte the locavores jump on board, rolling out the Harvest Moon Grille truck with locally grown foods from nearby Grateful Growers Farm. Los Angeles saw the addition of Takosher, the nation's first kosher food truck, as well as the very non-kosher but decidedly luxe Lobsta Truck. Manhattan trucks keep getting more metropolitan, with a Bistro Truck that serves up a Niçoise sandwich for lunch, and the Big Gay Ice Cream Truck's outré flavor selection that includes wasabi pea-powder, olive oil and cardamom. Post-millennium we saw a spike in the rise of artisan cocktails around the country, but this year trendsetters have taken them to new heights with concoctions that reflect rarer ingredients and fresh vegetables as often as fruit. Market-fresh mixology shows up in New York at Almond with a Gibson featuring housemade pickled ramps, while A Voce Columbus mixes a margarita with red, green and yellow bells, roasted poblanos and habaneros. SD26's Pinocchio cocktail features house-made fennel syrup as well as fresh fennel. Across the country, LA's Drago Centro changes up its cocktail list seasonally with ingredients ranging from muddled chives, fresh cape gooseberries, artichoke hearts and garden herbs including basil and sage, while Mark Peel's The Tar Pit livens up drinks with dandelion bitters and pine liqueur. This year's star comeback is undeniably the old-fashioned shrub — house made fruit-based vinegar syrups — derived from the Arabic word sharab that means literally "to drink." It was also a colonial favorite with brandy or rum. Today it adds both a sweet and tart edge to cocktails. Prune your way to happiness with a Dutch plum shrub at celeb chef Tyler Florence's SF restaurant Wayfare Tavern, or toast with a bubbly champagne shrub in Philadelphia at City Tavern. Cheers!.